To share the magic of Christmas, Horseware is giving fans the chance to make their horsey wish come true with 25 days of #horsewarewishes. To kick off the festivities, EP realised the creative vision of Emma Massingale, whose Connemara ponies took on the new role of Christmas wish granters for Horseware. They made for a useful stepladder and showed off their talents as Christmas tree decorators, oh and they also make a mean noseless snowman. How was the idea of filming inside a snow globe formed? The brilliantly bonkers idea was actually conjured up inside the totally amazing brain of Emma Massingale – I think she had always wanted to do it and what actually says Christmas better than four beautiful grey Connemaras inside a giant snow globe?! The great guys at Horseware loved the idea and felt it a brilliant festive follow up to the film we made with Emma’s ponies in the Rambo factory a couple of years ago, which was a big hit! Emma Massingale’s ponies are the stars of the show, what are they like behind the scenes? Exactly as they are on screen – beautiful, calm and very loved. They are all very chilled, lovely ponies and have an unbelievable rapport with Emma – it is amazing to watch and was a real privilege to be there and see her work with the ponies, their relationships are amazing. Emma’s place has a lovely relaxed feeling to it and she probably won’t mind me saying that animals definitely rule the roost and come first – Luigi the micro pig tried to get in my suitcase! The reaction has been incredible, the film has gone down a storm, you must be delighted with its success? Yes, over the moon! And with its release on the last day of November how better to kick of December and Christmas?! I think we knew we were on to something special – it was just up to us to capture these amazing animals in the unique setting and get the magic on screen. There was a lot at stake with two ponies, a snow globe and a ladder, what challenges did you face and how did you overcome them? That was all Emma, her brilliant ponies and all the hard work they had put into training inside the globe. From our point of view, we were obviously in a confined space and the cameras didn’t have much room so we had to be mindful of this whilst also ensuring we got what we needed without getting in the way of the ponies. We also had to keep an eye on the ever-changing sun and light and the shadows that were cast over the globe. Gosh too hard to pick! I love all the scenes inside the globe and I always smile at the moment the little boy wakes up on his “pony pillow”. I also love the wide shot from the outside of the globe – I think that showcases brilliantly just what we achieved. During the filming I had to keep pinching myself to make sure it was all actually happening. A highlight has to be the little helper putting his ladder up against one of the ponies to reach up to the top of the Christmas tree, how many takes did it take to achieve this? The pony and the little boy were foot perfect, it was the tree itself that didn’t play ball! It insisted on leaning the wrong way at the key moment. 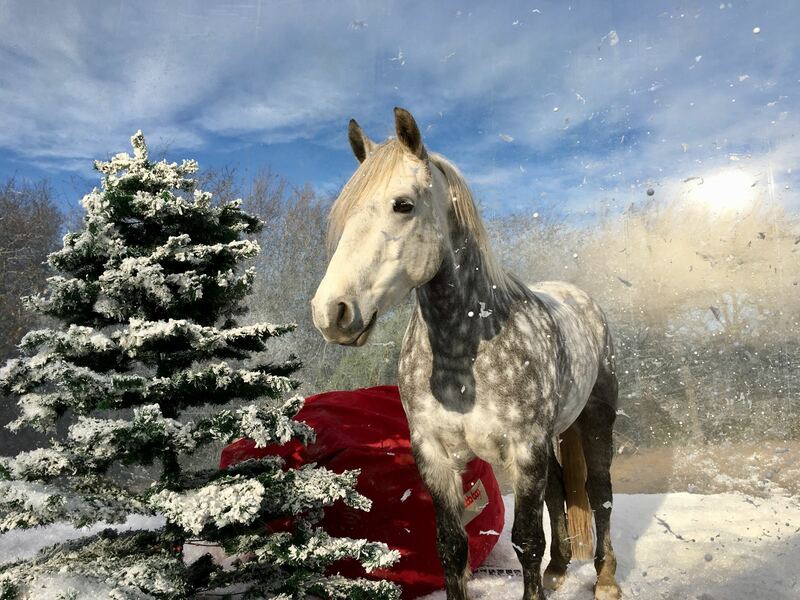 To be honest we just kept rolling and let the scene play out – you are not really going to get too much bad content with a beautiful horse and gorgeous little boy inside a giant snow globe – we just kept recording! And it was brilliant to see some of the superstar names of showjumping also feature in the film, how did those come about? Carl Hester, Ingrid Klimke and Cian O’Connor are all Horseware sponsored riders and Horseware had them filmed at their yards by a camera operator called Lucy Nuzum, who did a great job in bringing out their excitement and curiosity of their gifts!! It all worked really well and we were delighted with the end results. With more than a million views on Facebook and such lovely comments too, it’s fabulous to see it going down so brilliantly!